Phyzics Eyewear is unique and patented, and has solved one of the major weakeness of eyewear design. Most eyeglasses use a hinge to connect the temples to the frame front. Over time, hinges can wear out and break. 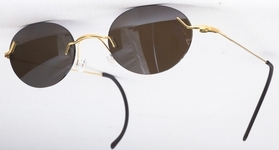 Phyzics Eyewear created a technology that uses magnets in place of traditional hinges. Magnets never wear out, and they cannot break. When stresses, the magnets simply part, and then you just put them back together. The design eliminates side pressure caused by standard temples. The unique fit combined with a lightweight titanium design results in an amazingly comfortable fit. The Phyzics collection includes 12 pre-set lens shapes. With today's patternless lens edging technology, opticians can modify these lens shapes to create designs to meet any customer needs. The magnetic hinge design eliminates broken frames due to metal fatigue. When under pressure, the frames disengage at the temples rather than breaking.